The Realm Platform helps you build cross-platform native applications, with sophisticated reactive features, realtime data sync, and robust offline experiences. It has two foundational components – the Realm database, an embedded client-side live object database, and the Realm Object Server, a realtime synchronization and event handling server – and these have worked great for anyone handy with Linux or Mac, Node.JS, and PostgreSQL. But, if you were a .NET stack developer, with a preference for C# and Windows, and maybe some important data in SQL Server, Realm only met you halfway. You could use Realm Xamarin to build native client-side apps with C#, and you could rely on our .NET Core support to start using Realm in server-side applications, but most of the rest of Realm required you to work outside of the standard Microsoft stack. Until today. We’re pleased to announce Realm .NET, with robust support for critical Microsoft stack technology across the Realm Platform. We’re shipping three new things that are available today: the new Global Notifier for .NET, new sync on Windows/UWP, and data encryption support for Windows/UWP. In addition, we’re announcing a new SQL Server Connector, making two-way data integration between Realm and SQL Server dead simple, and giving mobile dev teams a much better way to bring legacy databases into their realtime, offline-ready applications. The SQL Server Connector is in private beta today, but will be available to Enterprise Edition customers beginning in December. Demos speak louder than words, so we’ve created a simple demo video as a quick introduction. 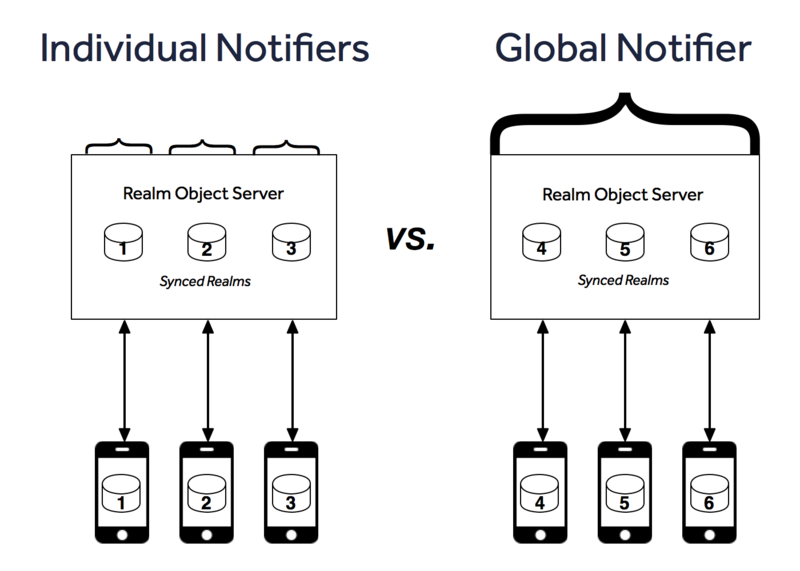 Then read on for a deep dive focused on the Global Notifier, and find more details on Realm .NET in our docs. When we shipped .NET Core support in the summer, we enabled you to start using Realms in your server-side applications. This made it effortless to distribute new data to all your connected clients by just writing it to the user’s Realm on the server and letting Realm handle the synchronization for you. Reacting to changes by users wasn’t that easy though, as when you have thousands of user-Realms, any of which can change at any given time, keeping an open instance for each one of them is simply not feasible. This is where the Global Notifier steps in – it is heavily optimized to observe huge amounts of Realms and notify you whenever any of them changes. Essentially, the Global Notifier is a NuGet package you add to your .NET project (it can be either .NET Core or a classic .NET Framework project, such as Asp.Net, console app, or even WPF app). Then, you implement the INotificationHandler interface that exposes two methods that are called by the SDK itself: ShouldHandle allows you to specify which Realm paths you’re interested in observing. HandleChangesAsync will be invoked when an observed Realm changes with detailed information about the state of the Realm just before and just after the change. Finally, you start the notifier by calling Notifier.StartAsync) and pass it all the notification handlers you want to register. And the cool part is, you can deploy this app anywhere you want – it doesn’t have to sit on the same instances that are running your Realm Object Server. Let’s see how we could use it to create a handler that will analyze the sentiment of a support ticket by using Azure’s Text Analytics API. If you want to skip the step-by-step tutorial, jump right ahead to the completed sample. A running Text Analytics Service and its API key – Microsoft offers a free tier giving you 5000 requests/month to try it out. A Professional or Enterprise edition token for the Realm Platform – sign up for a free trial here. What this is doing is sending the Description value of our Tickets as the text we’ll analyze and assigning the consecutive index of the object in the array as the Id of the document we’re analyzing. The document Id needs to be unique just for the request scope, so that approach is perfectly fine. What’s interesting here is that we’re creating a ThreadSafeReference for the object. The reason is that, even though we’ll change it on the same thread, details.CurrentRealm, to which ticket.CurrentObject belongs, is read-only (as it is pinned to a specific version and we wouldn’t want things to change while processing the changes) and we’ll open a different Realm instance to write the changes to the ticket. To obtain the same object in a different instance of the same Realm, we can pass the object by its primary key or use ThreadSafeReference which works even for objects without a primary key. Make sure to keep a reference to the notifier for as long as you wish to receive notifications. When you want to stop your application, make sure to dispose of it to avoid any native memory leaks. You can find the complete sample, along with a user and employee apps in our Feedback Manager repo. Realm World Tour Wraps for 2017 – See You Next Year!